A big Thank You to our community. We just turned 3! On this day, 3 years back – I started Analytics Vidhya. I knew I had to address the glaring knowledge gap in the industry, but I did not know “How to address the knowledge gap?”. So I started Analytics Vidhya as a blog. Over these 3 years, we first blossomed as a blog and have now transitioned the blog into a community. Going by a popular statistic, less than 10% of start-ups see this fate. We have been lucky to do so. God has been kind and so has been the awesome support of our community members. I have called up many of you at odd times with seemingly weird requests, but never has a request been turned down – no matter what it is. I feel proud and blessed to know you and be a part of shaping this community. Back in 2014 – I left my well paying job to raise 2 babies together. Jenika (my daughter) was barely 6 months then and Analytics Vidhya was starting to get a few thousand visitors a month. I knew I wanted to create a knowledge engine for the world, but didn’t know how I would do it. Thankfully, I didn’t dwell much on that question. We just focused on adding quality articles and resources to our portal. With each article and each question this community wrote, we served many more people with high quality knowledge. Obviously, there were those odd days, when I felt things are not moving as they should. But thankfully, they were small in number and I had the support of my friends, family, our awesome team at AV and the larger community. I truly believe that the best is yet to come – now more than ever. All our new initiatives in last year have seen tremendous response from the community and we have no plan to change that any time soon. Today is our 3rd Birthday! 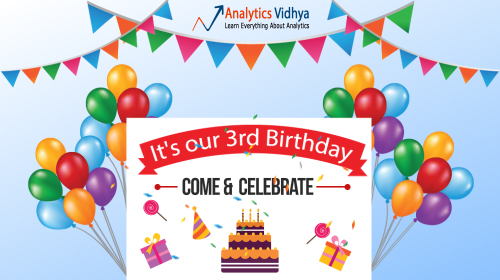 Analytics Vidhya has completed 3 years of its dedicated support to global analytics community. And, we’ve made sure there is a lot on table for you to feast. Let’s begin the party! Yeah! I knew many of you wanted to know this. To make this occasion special, we have set the table with many exciting options. Also, this occasion marks the beginning of AV Data Fest 2016. We have arranged a workshop which is meant for anyone interested in learning more about data analytics. You can attend this even if you don’t have any prior experience in analytics. Some background in statistics will help, but is not mandatory. All your concepts will get clear from the video tutorials and content we are providing. You will also get to work on a practice problem at the end for which you will be getting a score to evaluate yourself. Are you looking to develop additional skills that will make your demand higher in the job market? Then you need to practice and exploit your skills. Here we are! with a series of hackathons for you. Test your competence level and get to understand where you need to work more. Do you possess the blend of creativity and analytics? Can you take an unstructured business problem and solve it using your structured thinking? Take this challenge and find out. If this does not fulfill your appetite, then you can try something more challenging. Dig into the many essential concepts of Machine learning, R , Python, Predictive Modeling and Data Mining. So now you possess the tag of being into the sexiest profession and know how to deal with large amount of data. This is the chance for you to get the limelight by showing off your acquired skills to the community of data scientists out there. And what if we say that you also stand a chance to grab the best in industry job profile. A 3 day contest where you will get to play with your machine learning or data mining abilities. The brand itself suggests the value of this hiring hackathon. You may get to work with one of the most famous multinational company. Considering the response we have got from our community members I feel a deep responsibility to make most of my time here and serve you the best I can. In the end, I would personally like to know your feedback so that we can improve, your experience (good or bad) or a success story. Please feel free to drop a personal note at [email protected] or leave a comment here. I’ll be waiting to hear from you. Thank you for your awesome articles , It really helps a lot for a fresher like us who wants to build a career in analytics Industry. I was just wondering when u guys are coming with an APP?? App is one of the things we want to do, but we do not have the bandwidth currently. Will keep you posted if we move ahead on it. Thanks for these wishes. I am sure the community will make a much larger impact by itself. Kunal and AV team, you’ll are doing a beautiful job in giving back to this community and we AVions will make sure to keep spreading this knowledge! Kudos Guys! Thanks Ulhas. That is the spirit which keeps this community rocking! A great journey. AV has been so valuable for many of us. Thanking the whole team of AV and the community on this feat!!! Thanks Karthik for your wishes. I simply love what you guys do and thou I am still a begginer I know I will learn a lot from you all. Thanks Amar. All the best for your journey. Hope to see you on top of our leaderboards in future. Many Congratulations to you and the team at AnalyticsVidhya for completing 3 years. You guys are doing a great service to the Data Science community and I can proudly say that I am one of the beneficiaries. AV platforms is just awesome with crystal clear articles, great hackathons and valuable discussion forums. Thanks and All the very best. Thanks Karthik for following us. Do look at our workshop and let us know, if you have any feedback at part of it. AnalyticsVidhya is an excellent website and resource for many communities that share a common interest in data analysis. Thanks Marshall for those wishes. Hoping to see you some time in India! Thanks Balaji. Do give us feedback once you have completed the workshop. Congratulations Kunal and Team! You are doing great job! 3 years …. just a baby 🙂 happy birthday AV best in the world for Analytics ! Happy Birthday. AV was the best feeding for the data starving people around the globe . Thank you AV team for knowledge sharing. Happy birthday, Vidhya Analytics! More, please! Congrats Kunal and AV team. You guys are dong a great job . you are providing many valuable things for a person to become a data scientist. Thanks Hunaidkhan. We will surely do our best to help more and more people learn data science. Congratulations Kunal and AV team. Thanks Mohan for your wishes. Kudos to Kunal and Team ! Fantastic work. I look forward to an ‘AnalyticsVidhya University’ paralleled similar to MongoDB University /KhanAcademy with Video lessons. Thanks VumC – thanks for your wishes. A parallel similar to the names you mentioned is definitely high expectation! As I said, keeping focus on delivering one thing at a time has helped us tremendously and we will continue to build more and more useful content for this community! My heartfelt thanks to Kunal and the AV team. You are one of the person inspiring me to share the knowledge with others. Your contribution are high standards and I wish you all the very best ! Congratulations to you and your team on a job VERY well done! Analytics Vidhya has become my “go to” community for deepening my knowledge on data analytics. Your tutorials and explanations are clear and explain the “why” not just the “how” of selecting and performing visualization and analysis. Thank you for continuing the conversations under the “Leave a Reply” section – your responsiveness demonstrates how much your heart is in helping others learn and succeed. Very grateful for your generosity! Congratulations Kunal and AV team for coming up with an outstanding blog on Data Science/Analytics/BI/BigData. The articles are detailed, well articulated with lot of examples and resources for learning. Thanks for all the sharing with the community and wishing you and your team continued success. Congratulations AV. Its a great learning portal for novice people like me in the field of Data Science. All the best. Thank you for the nice articles. These are written in very easy and simple way and are really useful. AV is being at its best with its quality and depth in each topic they have taken up. I am very glad that to receive articles from AV in my inbox. In Vast area you are letting others know the treasury with AV articles. Keep post articles and conduct hackathons…. -by future R,Python and Tableau, qlikview professional. First of all congratulations for the brilliant achievement. Secondly it has been an amazing experience since the time i have joined this forum. Lots of helpful articles. I have one query, i have corporate experience of 2.5 years however never did any project on data science. I have just started learning data science. What are the challenges i will be facing job wise and learning wise. Again thanks a lot for your support. Please come with video tutorials as well, it will be great. AV is a great resource for analytics, especially to the Indian Community. On the UI side, for some reason I always have a problem with the scroll bars…left or right and up or down…tried various browser but still the scroll doesn’t work with the mouse wheel. Also, I believe the graphics used could be little sober using lighter backgrounds and beautiful fonts. A big congratulations. This platform helped me a lot in learning so many new things in data analytics field. Thank you so much for being so awesome with your articles and blogs. Started learning the specifics of Data Analytics with AV. I am very optimistic about Kunal and team! I was suffering from fever and unfortunately missed the classes. So is there any plan of arranging the same in near future? I’m highly interested about the beginners course. Also will these videos be available for download and watch later? Thanks in advance.